Ideal modern kitchen idea that takes inspiration from old kitchen styles with ample storage units in a white finish and floor in wooden finish. This simplistic kitchen idea borrows heavily from the elements of the old kitchen. 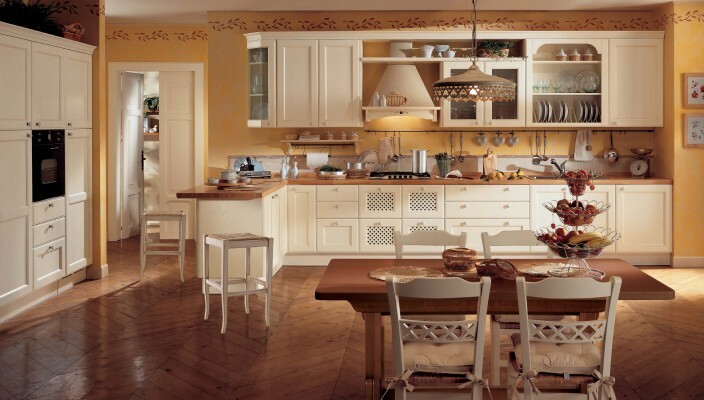 The cabinets, racks and storage units are in a light white finish, while the floor has been designed in wood finish. In spite of using the classic elements, the design doesn’t lose its appeal to the modern home, which is mainly due to the space available for kitchen appliances. Additional dining table can be used for large kitchens in the same wood finish.